My kids love the new Disney Junior show, Doc McStuffins. They love the characters, the songs, and even the lessons about staying healthy. Of course, the fact that the show has a plethora of toys for Doc to interact with doesn’t hurt. I’ve written before about Doc’s father, but the other day, I felt like Doc herself. The kids were getting ready for bed. They were in their PJs, nighttime allergy medicine was taken, teeth were brushed and they were climbing into their beds. As NHL picked out which toys he wanted to cuddle with that night, he let out a cry. Something was seriously wrong. I came to see what was the matter and he explained that his turtle’s leg was coming loose. 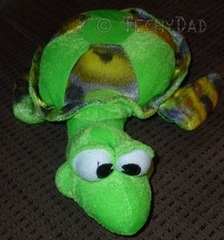 This was a turtle that he had won at the Disney Social Media Moms Celebration Dinoland party. 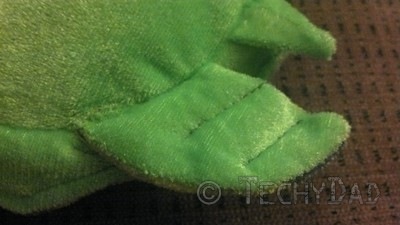 I checked the turtle out and immediately saw the problem: A busted seam. It was bad, but completely fixable. I reassured NHL, took the turtle with me, got my sewing kit and got to work. Pretty soon, the leg (fin?) was fixed. The stitching might not have been as clean as the original, but I reinforced mine so that it would last. Plus, it’s not really that noticeable unless you really look for it. My only disappointment was that, in hindsight, I wish I had taken some photos of the busted seam and the sewing in progress. My mind wasn’t focused on "This is a blog post in the making", though. Instead, it was mainly focused on "I’m fixing NHL’s stuffed animal the way Doc McStuffins would fix a toy." Yes, I channeled my inner Doc to get his toy feeling better. And, yes, I was a little disappointed when the turtle didn’t leap up post-toy-surgery to sing "I feel better!" Still, The appreciation from NHL when he saw his turtle was fixed beat any magical turtle serenade.